Today, the community nutrition educator at the Tevis Center for Wellness is sharing her love of cooking and passion for healthy eating through Carroll’s Cooking for Wellness℠ monthly classes, where participants make a dish to take home with them for dinner that night. “It’s always healthier to cook at home, where you are in control of the ingredients, and it’s almost always less expensive to make it yourself for most food items when you break it down by cost per recipe,” Walsh says. 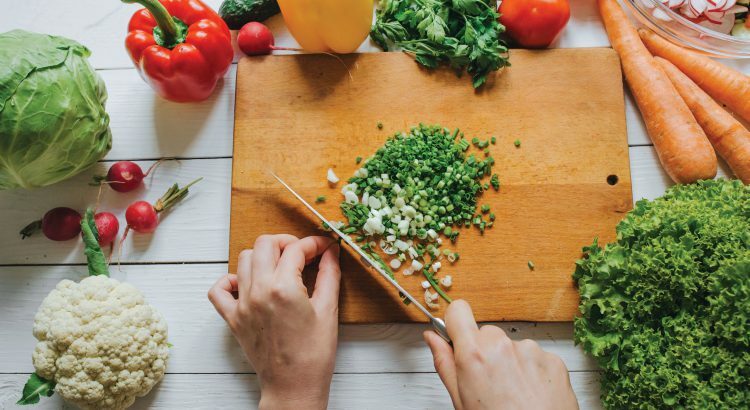 Offered in collaboration with The Partnership for a Healthier Carroll County, the class is a way for people to try a recipe they might not attempt on their own, learn some kitchen skills and tips, and leave with a healthy meal. Walsh chooses simple, healthy dishes with a limited number of ingredients for the class. She also tries to choose culturally diverse recipes that can expose participants to ingredients they may have never cooked with before, such as fresh ginger. And if Walsh is able to break down barriers in the kitchen and show that cooking at home can be healthy and delicious, she considers the classes a success. “Once you expose people to good food that’s also healthy and simple to prepare, they’ll make it and share it with others,” she says. Carroll’s Cooking for Wellness classes take place each month in the Shauck Auditorium in the hospital’s East Pavilion. Class fee varies, and space is limited. To register for an upcoming class, call Care Connect at 410-871-7000. To learn more, visit CarrollHospitalCenter.org/Cooking. Do you have a list of upcoming classes? Thank you for your interest in our cooking classes. The next month’s class is announced the day after the current month’s class is completed. Please visit https://www.carrollhospitalcenter.org/cooking on November 16 to find out December’s lesson!